From 28-30 November, Swinburne University were the proud hosts of the first TOM (Tikkun Olam Makers) Makeathon in Australia. In much the same spirit of the “Hackathon” model, TOM brought together teams of “Makers” and “Need-Knowers” to work on solutions utilising innovative tools and manufacturing aimed at positively influencing lives impacted by everyday barriers. Multidisciplinary teams were assembled including: A Need-Knower (either an occupational therapist or, member of the community with a physical challenge impacting their everyday life), computer scientists, IT experts, designers, engineers, biomedical scientists, etc. Over the three days, teams worked collaboratively, fuelled mostly by coffee and snacks to develop their assistive technology prototypes. The solutions they produced were charged with the goal to deliver tailored and individualised technologies to change the lives of people living with disability. I was fortunate enough to represent HISA as one of the judges. Amongst the chaos of the final hour of working, human traffic in the room and noise of 3D printers hurriedly printing off last minute materials, we heard stories about the trials, tribulations and successes of teamwork. The showcase of innovations was amazing with true early stage potential to create lasting solutions to improve the lives of many. To make things better, the core ethos of TOM is to create open-source, scalable solutions replicable around the world! Some of the technologies that struck a chord with me as a Physiotherapist included: an infrared activated wheelchair headrest to maintain stability through range of motion, portable solution to assist wheelchairs over single step obstacles, set of forearm crutches designed to turn into a portable chair and customisable dashboard to replace a video game controller for people without the required dexterity. One team reminded us of some key lessons for designing health tech, and digital working: don’t be overconfident too early, the first iteration is not likely to be the end solution, don’t expect things to work perfectly the first time and that professionals from different backgrounds bring valuable perspectives to creating the best solution. This same team had the task of developing a remote way to turn on a laptop for someone without the hand function to reach and press a button. Their solution involved a track that directed a simulated finger to press the power button once activated by the user. They got it working just 2 hours before the end of the Makeathon to everyone’s delight! A successful final effort. 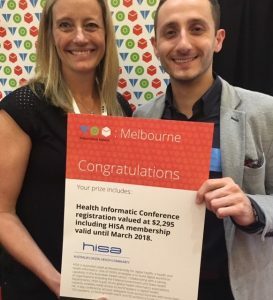 HISA supported the competition by awarding one prize of HISA membership, as well as registration to HIC. As a professional body, we aim to build digital workforce capability in health. By offering a standout TOM candidate the opportunity to join our digital professional body and attend HIC, the aim was to give a driven individual the chance to both add value to and gain experience from a strong health informatics network. The prize was awarded by the judging panel to occupational therapist, Gemma McDonald, who was a key member of not one, but two teams working on solutions to benefit her patients. TOM is next off the USA to continue to spread the message. For more info check out http://aus.tomglobal.org/.